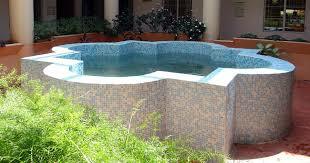 Many property owners choose to install a concrete pond because of its durability. And while such ponds are robust and will stand the test of time when properly managed, they are not invulnerable. Any container which holds water is subject to leakage, even if it is made out of a material as strong as concrete. Below are some best practices for repairing it. Concrete style ponds are built through the addition of sand, gravel and water to cement. Leaks will occur when the bond becomes too weak in a specific area. These problems are often a consequence of poor construction on the part of the contractor. If the cement mix is not done in just the right way it may be insufficiently hydrated which causes a cure that is uneven. Concrete contains areas which are microscopic and which allows water to move easily due to absorption. If a leak in the pond is suspected, you will want to fill it up to its standard level, and then mark it, which can be accomplished with duct tape. Afterwards, while the filter is running, wait between twelve and twenty four hours and then measure the amount of water that has been lost. Now refill the pond to its standard level again but deactivate the filter, then wait twelve to twenty four hours again and then review the water loss. If more water is lost while the filter is running, this means the leak will be found on your plumbing’s pressure side, past the pump’s impeller. If less water is lost while the filter is deactivated, it means the leak will be found on the plumbing’s vacuum side, before the pump’s impeller. The first step in repairing the leak is to identify the source. Once the source has been identified, a sealer can be used to close up the pores. The best tool for doing this is food coloring. First you will remove the fish from the pond and place them in a temporary container, and then you will need to deactivate the pump about sixty minutes before you apply the food coloring. If the concrete has cracks in it this will be pretty easy to spot. Apply the food coloring near a crack, and it should pull the coloring in. In a situation where no cracks are visible, you will then need to apply the food coloring to every object that penetrates the pond’s shell, such as the drains, lights, and returns. Review the skimmer’s mouth in the spot where its plastic comes into contact with the concrete. This spot is prone to moving and its separation can cause leakage. After locating the leak repairing it is straightforward. You can use either a sealant or patching material. Most brands are waterproof. Once you’ve applied the patching or sealant use the food coloring to confirm the leak has been fixed. If you perform the patching or sealing near the fitting, be sure that the pump remains off while the curing occurs, otherwise the moving water could remove the patch.